It had rained earlier in the afternoon, but now the sky looks clean. The ground is still steaming from the shower. As we make our way through the shop lined streets, the heady fragrance of the yards and yards of jasmine strings in the market is pushed aside brusquely by the musky middle notes of the golden ripe fleshy jackfruit seeds lying almost lasciviously on the hand carts. When the senses recover from this olfactory assault, the base note that triggers hunger pangs afresh is the lovely aroma of yummy things frying in fresh smelling coconut coil! Mounds of golden cashews fried in fragrant coconut oil, seasoned with spicy freshly ground pepper, crisp yellow banana chips, brown jackfruit chips and crisp tapioca wafers, plump pozhampori or banana fritters! We are amused by the ubiquitous bunches of bananas of every description and colour (from petite finger sized to obscene foot long ones, and from golden yellow to green to red) hanging in almost every kiosk and shop, even from the ‘paan’ kiosks! We finally reach the beautiful colonial Victoria Jubilee Town Hall, where we are staging a play titled ‘Aatishbaaz’. It is a Hindi adaptation of the ‘The Fire Raisers’, which itself was the English translation of Max Frisch’ German play ‘Biedermann und die Brandstifter’. The occasion is the Indo-German Cultural Week, September 1979. Some people have already started gathering in the lobby. Oh dear! Egged on by the director of the play, we rush towards the back of the theatre, only to stop dead in our tracks- what a serendipitous discovery of the beautiful floral carpet with a shiny tall brass lamp in the centre – we learn it’s called a pookalam. What a beautiful concept! Geometry ensconces art! The riot of colours and textures contained in stencilled discipline. Delicate white thumba flowers outlining and enhancing sections of colourful flowers, leaves, rice flour and wait a minute- what is that all pervading base tone of this mixture of fragrances – coconut? Of course, desiccated coconut! Is it any surprise? We are after all in Kerala, the land of the Kera- or coconut. The play our troupe was enacting, Beiderman und die Brandstifter, is a dark comedy about the self –deluding arrogance of the bourgeoisie who don’t believe they will fall prey to the evil. 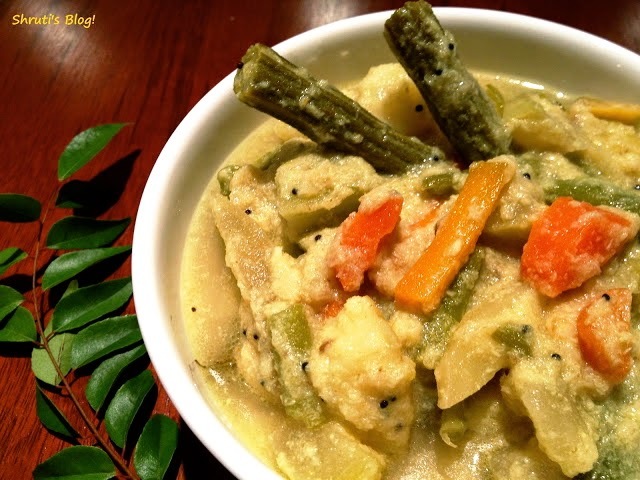 Avial is a dish that is a mainstay in the Onam feast, the Onam Sadhya. Made of mixed vegetables, much like other favourites of mine in this genre, such as oondhiyu, eshtew, lekurvaali bhaaji or the Konkani khatkhata, to name a few. Place all the vegetables in a pan and add water to cover the vegetables. Add the chillies, salt to taste and turmeric. Switch on the heat under the pan. When the water starts to boil, lower the heat and cover the pan. Stir from time to time. When the vegetables are half cooked, add the chopped mango. In a few minutes, add the ground coconut-onion paste. When the vegetables are all done and the water has reduced, check and adjust all the tastes. Turn off the heat. In a small pan, heat the coconut oil and add the mustard seeds to splutter. Pour this hot oil tempering on to the avial and serve. The avial goes very well with rice as well as rotis or pooris. Some of us, including myself, can eat this dish in a bowl just by itself. I also make avial with yoghurt. As I said earlier in the piece, I love these mixed vegetables from different communities. There can’t be a better way to express thanks giving for the bounty! Good recipe. I too like to eat mixed vegetable as it is in a bowl.